ZENITH supplies two types of Extruder. Hot Feed & Cold Feed Extruder. Hot feed screw type extruders are heavy-duty machines built to suit individual needs. They are made in many different type and sizes to meet the production requirements for straining extruding, tubing, slab production or contoured shapes. The extruders size depends upon the hourly output required and method of feeding with a complete line of equipment is available to meet with all customers need. The Cold feed Extruders have been developed for processing cold rubber compound. Since these machines in addition to extruding profiles also plasticize rubber; they differ from hot feed extruders, they have longer screws; heavier gears boxes and higher drive power. According to present stage of development cold feed extruders can be used for extruding almost all rubber compounds, which are process able on hot feed extruders. Feeding is normally in the form of strips or pellets. Machines with longer screw diameters are often fed directly with wig-wag stored slabs. Worm Dia. L/D ratio Worm Speed R.P.M Capacity Kg./ H.R. App. Electric Motor K.W. BED The basic bed is heavily steel fabricated, machined to a single frame on which whole machine with gearbox and motor is fitted. WORM / SLEEVE The worm is mill cut and polished. Sleeve is fine machined and polished and ground hardened by Nitrating process along with cooling arrangement with close clearing to achieve longer life of worm and sleeve and efficient traveling of material (i.e. Rubber). 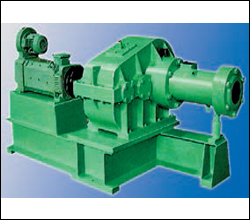 BEARINGS Extruder is jacketed with heavy-duty single double taper roller bearings as per Extruder Loads. DRIVE Worm is driven with belt and reduction gearbox arrangement. HEATING / COOLING Cast iron / Steel fabricated body is jacketed for water-cooling or heating of worm and sleeve. NOTE : Technological improvements may result in change in specifications.